The Obama’s have two Portugese Water Dogs, Bo and Sunny. George W. Bush gave a birthday present to the First Lady, Laura, of a Scottish Terrier she then named Miss Beazley. The Clinton’s brought their family cat, Socks, with them to the White House. Later, they acquired a chocolate Labrador Retriever, Buddy, who never tolerated the cat. When the Clinton’s left the White House, they opted to take only Buddy, leaving Socks in the care of Bill’s secretary. President George Bush’s dog Millie had puppies while in the White House; Ranger stayed while the others went to good homes. The First Lady, Barbara, accredited their dog, a Springer Spaniel named Millie, with having written a charming book about a dog’s life in the White House. 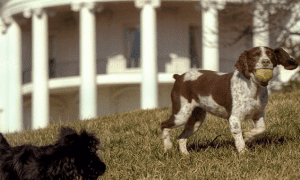 President Reagan’s dog Lucky, a Bouvier des Flandres, was sent to the ranch as she grew, being replaced at the White House by Rex, a King Charles Cavalier Spaniel. A spaniel mix named Grits, given to Amy Carter by her fifth grade teacher, was returned after refusing to take a heartworm pill during a Heartworm Awareness Week promotion along with relieving herself on the Lincoln Room carpet. Gerald Ford’s Golden Retriever, Liberty, had puppies in the White House. 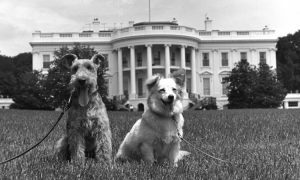 Richard Nixon had Checkers during his vice presidency and Vicky the Poodle, Pasha the Terrier, and King Timahoe the Irish Setter while president. Lyndon B. Johnson’s Beagles became famous for the President’s quirky behavior of picking them up by the ears. He also had a white Collie, Blanco, and a mixed breed dog, Yuki, both (thankfully!) with shorter ears. And so it goes all the way back to George Washington who had a collection of hound dogs. The unconditional love of presidential dogs has undoubtedly offered some solace to our leaders during tough times. 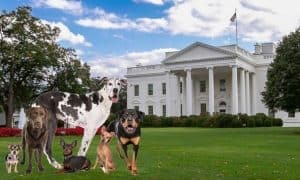 Can You Name these 18 Presidential Dogs? I wrote a wonderful childrens book about the Presidents dogs called WILSON AND THE WHITE HOUSE PUPS. It was edited by the White House Historical Assoc and all of the information is factual.